When my brother and I were growing up at home, we always did everything together. We hung out with our neighbor friends, rode bikes, played video games; the normal, sibling stuff. But I’m the older brother, and as the older brother, I was “in charge.” There’s a distinct memory my brother always likes to bring up to sort of torment me for my immaturity. Basically, whenever my little brother wouldn’t listen to me, I’d warn him, “If you don’t do as I say, I won’t be your friend anymore.” And he would always listen. Eventually, he realized that my words were moot, but today I still feel bad about treating my brother meanly. He’s my family first and foremost, and I would do everything I could to protect him. 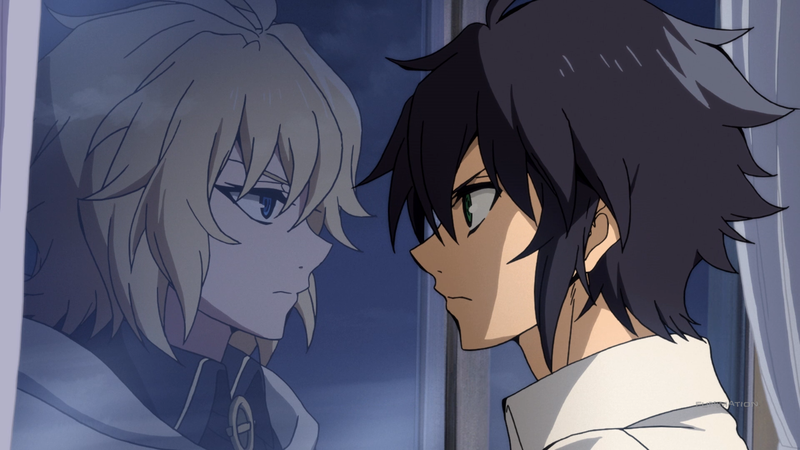 Owari no Seraph is about brothers, family, and protecting the ones you love, but it turns out, it’s the one that needs the saving. Owari seems to take place in modern times, revolving around vampires and their uprising following a virus that kills off many adult humans. Yu Hyakuya, a normal human boy, sees his family killed right before his eyes, with his purpose becoming the eradication of the species he has grown to hate so much. Looking at Owari a bit more closely, it’s actually pretty thematically interesting. It works with two separate ideas at the same time: the definition of morality and the importance placed on family. Sometimes, it even combines the two, forming a nice set of insights that allow the viewer to question what is right, what is wrong, and what he or she would do in that same situation. But there’s something holding it all back, something that the anime doesn’t shake off except for in one specific area. This is the show’s events not matching the tone of the show itself. Before getting into the stumbling narrative, it’s important to understand the previous ideas first. Morality is a concept we’re all familiar with. Picking up someone’s book off the ground for them is good, but taking it and throwing it in the garbage is bad. Helping someone cross the street is good, but kicking them over is bad. Often times, there is a clear-cut distinction between the correct and incorrect thing to do. The hardship comes when it isn’t black or white, but instead some shade of grey. For instance, is it okay to shoot a person in self-defense? What about spending money you earned on yourself over donating it to charity? The answers aren’t as easy because the situations are a bit more argumentative. Owari plays with this notion a bit, with both the human and vampire sides. Humanity wants to survive; they’re on the brink of extinction and used essentially as cattle for the vampires. That means doing whatever it takes to defeat their adversary, to the point of going the “ethically concerning” route of human experimentation. Is it wrong to mess with the genetics of a few people in order to save millions, especially without their consent? The same goes for the vampires. While their background isn’t as out in the open, they’re simply doing the same: surviving. That means sucking human blood and containing them in a manner that doesn’t spread disease and famine. Are they wrong for looking out for themselves? The humans are to vampires as cows are to humans, “meat” to be used for sustenance. The vampires’ actions might look bad to the humans, but to them, they’re merely living their lives. Throughout all of this, there is also the show’s focus on family and how it important is. Many of the happenings during the show highlight how much family means to people. The opening sequence and Yu’s inability to help, the Moon Demon squad and their relationships with each other, and even the covert operation that put the crew in danger because a little girl’s info was designed to protect her family are each instances of this theme of “family comes first.” Again, the vampires don’t show this as much, but instead the opposite. They don’t seem to have families, and instead work for themselves rather than the betterment of those around them. This is what paints them in such a bad light; their motivations are entirely selfish and are not aimed at aiding those close to them. So, why aren’t these two themes – morality and family – executed as well as they can be over the course of the season? The reason was brought up in the beginning: tone. This isn’t so much tonal dissonance, meaning that the tone is constantly changing. It’s that what happens doesn’t coincide with the tone it went for. The first episode had genocide, the murdering of children, poverty, rampant disease, and slavery. It’s a grim, despondent tone, with everything being as bad as one can possibly imagine. But the remainder of the season never reaches this same level. There are no more killings, no more deplorable conditions, and nothing overtly terrible happening to anyone. In fact, many of the issues they faced are gone: demons give them power, drugs let them fight, and pockets of humanity can be found all over. Since the rest of the season’s tone remains (nearly) consistently lower in terms of depravity, the aforementioned themes never have the chance to be explored to the extent that they should be by the anime’s standards. The moral conundrums are removed since the vampires’ goal is reduced down to killing humans only. Family becomes an afterthought when the cast never has anything remotely harrowing to overcome. Everything becomes rather complacent instead of the apocalyptic tension that had been initially conceived. 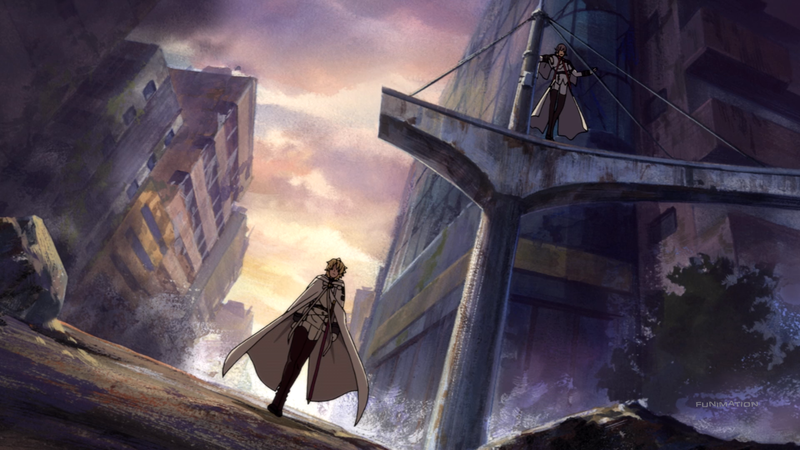 Earlier, “one specific area” was brought up because there is a situation that does manage to have that same tone: episode eleven, right before Yu’s transformation. There, Yu’s dilemma mirrors his initial one; he struggles with the protection of his “family” while simultaneously dealing with the moral implications of the decision he has to make. There the tone is the same as before and subsequently the themes are as prominent as they had been. That is, when the events taking place manage to capture the same feeling as the anime is attempting to portray, the motifs it utilizes take on that same strength. 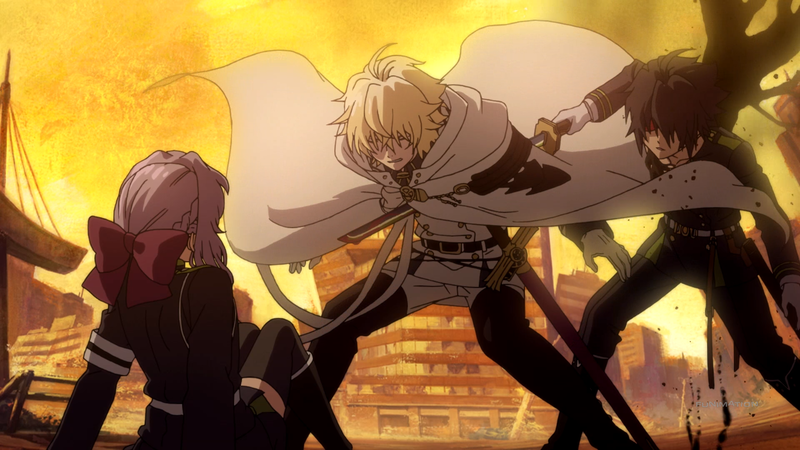 The majority of Owari no Seraph does not do this, reducing its overall impact. Owari’s art manages to keep itself from blending too much together due to the pastoral direction that it takes. The background locations seem painted, varying in their severity of dilapidation to make the world feel as decrepit as it is. Abandoned cars, disheveled buildings, and concrete structures are the norm, as are wooden shacks, abandoned subway stations, and classical décor. It makes everything feel lonely and barren, fitting the mood while contrasting with the themes nicely. Actual animation is severely hit or miss. When the show wants to go all-out, it can, and the fight scenes and detailed movements are nice to see. Then there is the opposite spectrum, where still frames and weird battle choreography take precedent. It’s mostly somewhere down the middle, but the really good and the really bad are usually noticeable. Many of the characters within Owari aren’t particularly engaging, mostly because the show has yet to fully develop them adequately. This is due to a common anime move where the series is (purposefully) split in two. In other words, this season gave the audience a lot of characterization and backstory for those involved. Shinoa has a deceased sister who was integral to the development of the “Cursed Gear,” but we don’t know anything else. Mitsuba has a hard time getting buddy-buddy with her comrades due to her own previous failures, but nothing more. Shihou has a sickly sister whereas Yoichi’s was killed, but there isn’t much more to them than that. It sounds like a dilution of their characters – and to an extent, it is somewhat of a hyperbole – but this is because the show strangely keeps the focus away from them after they’ve been learned about. Shihou and Yoichi, after the viewer discovers their pasts, are oddly absent from many of the dealings afterwards, saying only a few words here and there. The same goes for Mitsuba; after her initial telling and rescue, she doesn’t do much besides get flustered and angry. 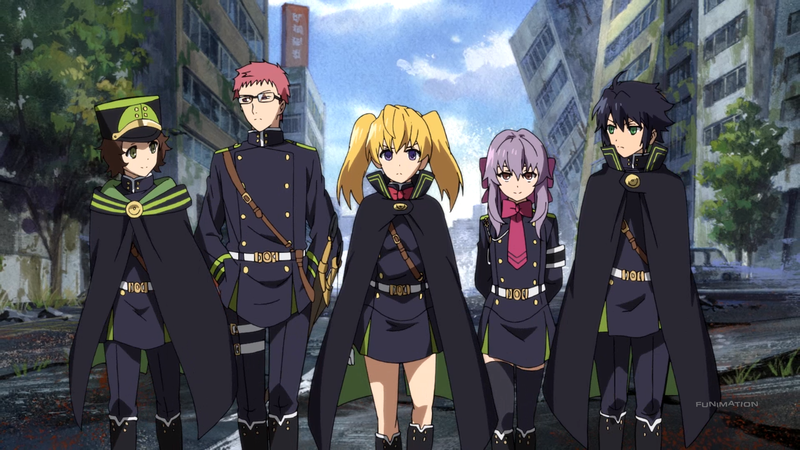 Shinoa and Yu manage to avoid this pitfall because the anime handles their cases in the correct fashion. Rather than a “get and forget” approach, the show takes its time with their individual persons, both in terms of personality and importance. This should obviously be the case with Yu, so watching Shinoa put on a mask to hide her true feelings – the fear she has when fighting, the care that manifests towards Yu, and the ambivalence she probably has towards her older sister – gave her character more dimensionality compared to the others. However, even if Shinoa and Yu manage to remain prevalent, there exists another character that is so frustratingly illogical that it becomes impossible to take him and his actions seriously. This is none other than Mikaela. Now a vampire, he harbors a hate for his kind and humans…which is weird, considering who he was and what he saw. Supposedly he hates all humans (except for, conveniently, Yu) because of the human experimentation they have done to him. But his reasoning makes no sense; he knows that Yu is not only a good person but so was his entire family, so extending the thinking that all humans are evil doesn’t make sense. It makes even less sense when one takes the themes into context. Mikaela was always the guy who was all about family and togetherness. So him being unable to see that Yu is alive because of these humans doesn’t follow his own characterization. The argument is that his turning and his time spent among the vampires has brainwashed him. This also doesn’t work for two reasons: he still hates vampires and their society and he is still able to recognize Yu for whom he is despite being human. He’s a poor character whose actions and thinking are asinine, which is a shame, considering how interesting his position in the anime is. The opening theme starts off with a distinct techno vibe that doesn’t fit the show’s overall mood. The middle of the piece is also strangely calm despite what the show tries to work with. The latter half eventually picks up the beat, but by that point the OP has already lost its power. As for the ending theme, it definitely fits better, being gloomier in instruments and vocals. Here, the second part of the ED is favorable, replacing the apparent loss with a nice sense of hope due in part to the singer’s impassioned words. Listening to the remaining tracks of the original soundtrack isn’t annoying but it also isn’t too much fun, either. There are tracks befitting nearly all circumstances, such as piano medleys for those sad moments and ominous tracks for the foreboding ones. A lot of them utilize instruments and tempos that sound off-kilter to make the situations feel that much more dramatic, but aren’t impressive in their own right. Unfortunately, the musical pieces all kind of mesh together after a while, becoming nothing more than background noise. Voice acting for the show is somewhere around average, with no notable performances to be had. I’ll admit that I was quite bored with the way this one went in the middle. I think part of it is not really knowing or understanding the vampires’ side of things. I know that they have factions and their own area, but I don’t know who they really are. Many of the vampires are, more or less, the same, just with different weapons and hair color. Some did bad things to others, but without knowing what makes them “them,” I had no investment into their characters. The anime provided nothing on the vampires, meaning Yu and his friends were the ones who needed to bring the entertainment. Mikaela is insufferable; that goes without saying. Yu was passable as the lead, but Shihou’s constant head-butting with his similar friend was usually fun. Yoichi was a bit too wimpy, at least for now, and I wish that Mitsuba was given more time on-screen since her character seems to be one of the more interesting of the bunch. 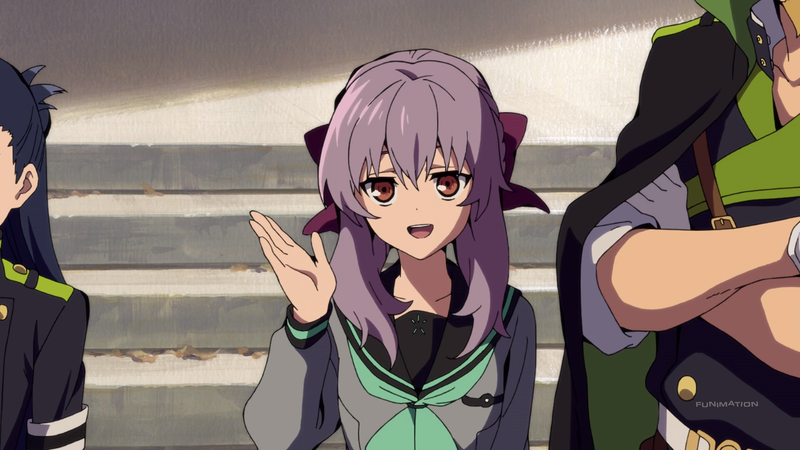 Shinoa, though, takes the cake; her smugness, sarcastic cuteness, and romantic feelings were always welcomed. Finally, if anything, the show managed to stick in my head for a few days after episode eleven; it was quite jarring and should have been like that the entire ride, not just right near the end. 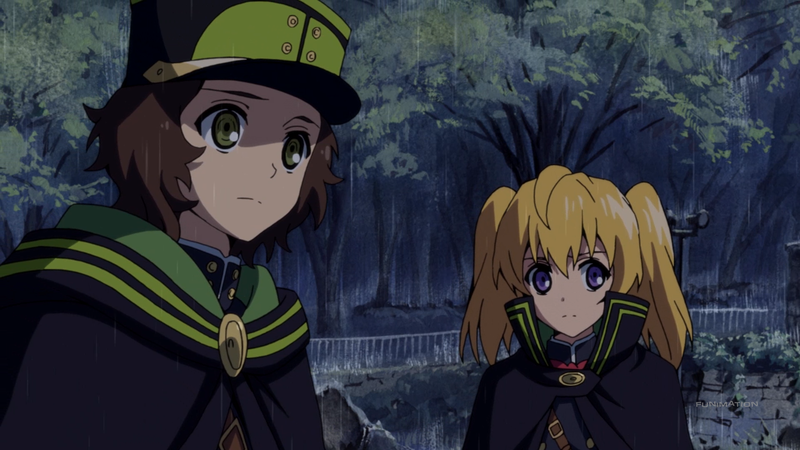 Owari no Seraph has a slew of interesting facets that each have a good amount of potential. But the execution is presently missing. The narrative needs to follow the tone, the cast needs more individual focus, and the animation needs more consistency, to name just a few problems. Considering the title of the anime, this one might need a bit of prayer to get it on the right track to conclude in a concise manner.